In this article, we will explain the benefits of pergolas and explore several methods of awning customization to find the pergola that suits your specific needs. Whether it be free-standing or wall mounted, remote operated or hand cranked, wood or plastic, to filter sun or disperse rain water, pergolas can be adapted to any location, purpose, or aesthetic. A pergola is an outdoor structure that consists of vertical columns, which support a roof consisting of rafters and crossbeams. This Renson Aluminum pergola features silent blade operation in addition to sun and rain protection. Apart from improving the appearance of your garden, the main purpose of a pergola is to withstand elements such as strong wind and direct sunlight. Pergolas are not permanent structures and you can relocate them to any strategic position within your compound. One should not confuse pergolas with garden arbors and gazebos. Gazebos are relatively smaller and have a simpler architectural structure. 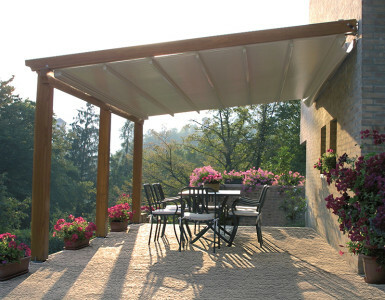 Pergolas, on the other hand, have a full-enclosure roof structure, which is highly adjustable. This motorized Sunair pergola is designed for larger spaces. A pergola is an enclosure that consists of an open roof, fabric shade and sometimes sliding doors. You can cover the open roof using motorized shades to prevent rain and direct sunlight from penetrating the pergola. An enclosed pergola is ideal during winter, as it will help keep you warm while still allowing you to utilize your outdoor space. Pergolas utilize the available outdoor space to create a room for outdoor activities such as entertaining or eating outdoors. Their exceptional design aims at offering you privacy while allowing you to enjoy the external view. This is great for extending a dining space in a restaurant, or having a protected outdoor space for children to play. Moreover, families can rest assured that pergolas utilize child safe window treatments for this purpose. 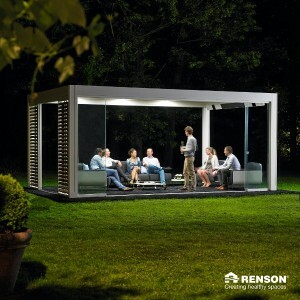 This freestanding Renson pergola is ideal for dinner parties. Pergolas are designed for the needs of the home or business. They are outfitted for several choices for types of roofs, window covering materials, and motorization integrations. Additionally, there are several options for powering somfy motorized shades, including solar, battery powered, lithium battery, a transformer, or even a hard wired system. You can add a retractable roof, sliding doors, powered window blinds or shades – or you can make it entirely manual. Pergolas come in many shapes and sizes, and can be customized for home or business. In the following videos, several options for pergola ideas, awnings, and roller shades are demonstrated by our lead expert in the field. The Sunair Outdoor Pergola System has an automatic retractable roof that you can position accordingly. This modern system exemplifies one of the top window treatment trends: Motorized window treatments. You can open or close the roof as it has a special motored design that allows you to control how much sunlight penetrates into the pergola. In addition, the roof has gutters that ensure rainwater does not penetrate into the seating area. The sliding doors and windows surrounding the pergola prevent elements from entering the structure while allowing you to enjoy the exterior view. This pergola ideas is an exceptional outdoor product that allows you to control how much shade or light you need into your pergola. It consists of an opaque fabric that forms a roller shade, which moves from the bottom going upwards towards the spring tension boxes via a motor. The system is fully motorized whereby you can control where you want the roller shade to stop. This feature allows you to determine your exterior views and enhances your privacy too. The Renson louvered outdoor living System is a freestanding structure that you can mount anywhere and is a great pergola idea for your home. Interestingly, you can mount the enclosure in either an open environment or a closed setting. 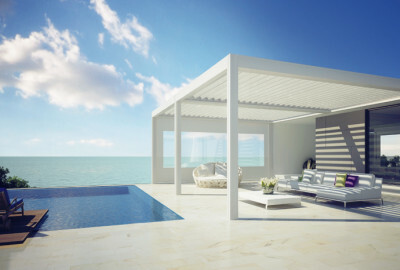 One outstanding feature about the Renson outdoor system is its louvered roof. The roof has sky lighting features and an inbuilt lighting system. In addition, you can close and open the louvers and you wish. When closed, the louvered roof has gutters that prevent rainwater from entering the enclosure. The gutters direct the rainwater to a pipe built on the sides of the enclosure. It also consists of a motorized roller shade that you can adjust accordingly. Another important feature is that you can extend the enclosure to cover an area of up to 20ft by 20ft. Another freestanding Renson pergola creates a palace-feel over this wading pool. The outdoor area is an important part of the home, or business, as it creates a big impression on any potential guest. Use our pergola ideas to create an ideal way of bridging the freedom of the outdoors with the feeling of comfort that you get from relaxing indoors. This is because pergolas act as an extension of your home’s design and create an atmosphere of ambiance and serenity. Feel free to contact us if you want to visit our showrooms in San Diego, Sacramento, or Orange County. We are always happy to answer your questions – don’t hesitate to call us at 858-452-6100. At 3 Blind Mice, we take pride in offering you our extensive line of window treatments and look forward to hearing from you about pergola ideas for your home.